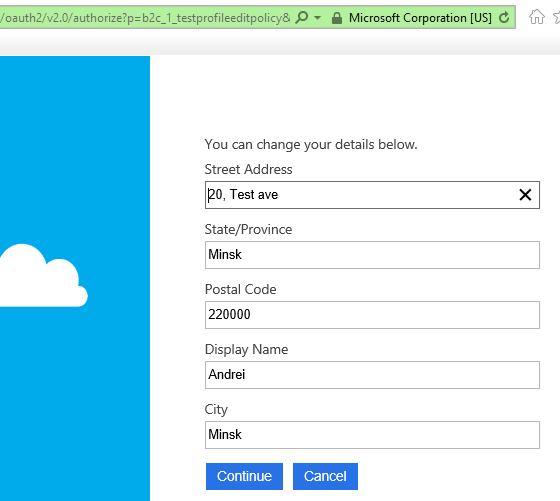 One of the policy types supported by Azure AD B2C is profile editing which allows users to provide their info such as address details, job title, etc. When you use the default ASP.NET Core OpenID Connect middleware to handle communication with Azure AD B2C you may run into difficulties making it properly redirect to the profile page and then handle the response when being called back by Azure AD. Update: Please check out this post for up-to-date info covering ASP.NET Core 2.0. The middleware takes care of providing the rest of the protocol parameters as well as state and nonce values which are used to later validate and correlate the response from Azure AD. This will make AuthenticationManager invoke the challenge with the middleware identified by the provided authentication scheme (AuthConstants.OpenIdConnectB2CAuthenticationScheme) and in case of the OpenID Connect middleware it should make a request to the authorize endpoint. If you're wondering about the policy parameter I recommend you have a look at my older post explaining how it is used when determining the correct configuration endpoint. The problem lies in the middleware that treats challenge responses thrown when there is an authenticated user for the current request as failed authorization. Thus, it tries to invoke the AccessDenied action so you could present the error to the user. However, from our workflow it's not an error and we expect the user to be authenticated before she can edit her profile. If the user hits 'Continue' she will be redirected back to the application with the regular authentication response containing state, nonce, authorization code and ID token (depending on the OpenID Connect flow). error_description=AADB2C90091: The user has cancelled entering self-asserted information. This somewhat unexpected response from Azure AD makes the middleware fail the authentication process. And it's correct from the middleware's standpoint as there are no artifacts to validate. We reconstruct the authentication ticket from the current principal and we know we can do that as the profile editing flow is only enabled for authenticated users. context.HandleResponse() is what makes the middleware back off and return the successful authentication result with our ticket to AuthenticationManager. Please have a look at the complete solution so all pieces come together.